Chinese headstone & grave in the Beechworth Cemetery, Vic. a portion is specially set aside for Chinese ... [picture], c. 1914 - c. 1941, by Carroll, James, 23 Etnam, West Preston, courtesy of State Library of Victoria - Picture Collection. Chinese ovens in the old Beechworth Cemetery, Vic. ... [picture], c. 1914 - c. 1941, by Carroll, James, 23 Etnam, West Preston, courtesy of State Library of Victoria - Picture Collection. Ernest Wong Chee with unidentified group at graveside, courtesy of M. Mar (private hands). Grave of Ruby Fay, 1945, courtesy of M. Mar (private hands). Grave of Pow Loong (RLB Grandfather grave). Coburg General Cemetery, courtesy of Chinese Museum (Museum of Chinese Australian History). Sarah Bowman's grave in Darwin, courtesy of Chinese Museum (Museum of Chinese Australian History). 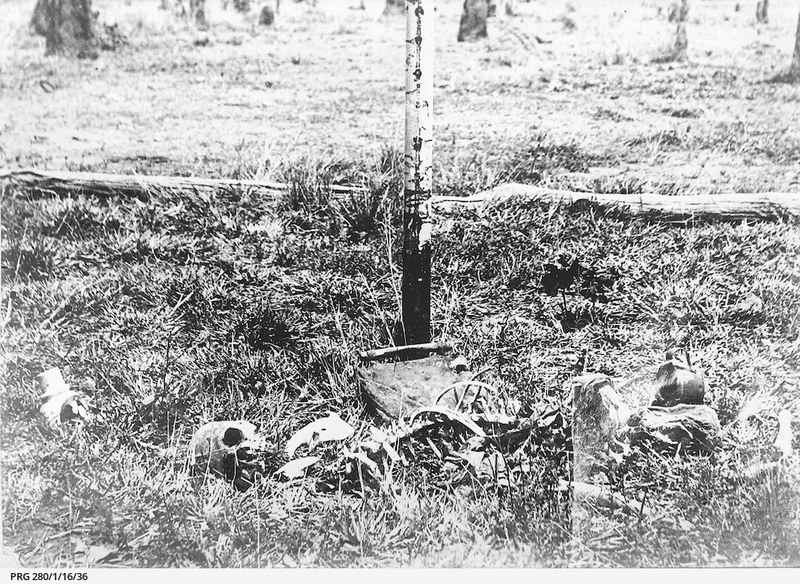 Tomb at the Chinese Cemetery, Darwin, by Brown, Percy, courtesy of Northern Territory Library. Chinese funeral, Innisfail, Queensland, 1890-1910 [picture]., c. 1900 - c. 1910, courtesy of National Library of Australia - Picture collection. Respecting one's deceased ancestors is a very important tradition in Chinese culture. Burial of the dead often involves a complex array of ceremonies and methods of burial that can include post-burial rites and care after burial. Acclimatisation of the deceased's spirit in its new environment in the underworld is of prime importance. Death and burial customs vary regionally but also according to the wealth of the family, marital status and age. Commonly bodies are exhumed about seven years after their first burial and the bones placed in urns. Many do not reach the second burial stage which can take many years. At this stage a geomancer is used, by those who can afford them, to determine a well-omened place for the tomb. It is important that relatives follow correct burial proceedures and take note of auspicous signs during burial rites. If done correctly a burial can bring prosperity and good fortune to the family and descendants of the deceased, conversely an ill-planned burial can lead to bad fortune. Outside China traditional burial practices often had to be modified. A well-known Chinese saying states 'upon the roots of the tree rest falling leaves'. This saying expresses the ultimate desire of Chinese to be buried in their home village alongside their ancestors where their spirits can be attended by family members. In Australia, Chinese immigrants were often separated from their families and kinfolk which meant that funerals had to be organised by friends or benevolent associations. In some areas individuals did not have the support of dialect or district organisations as the Chinese population was so small. In some of these cases they were buried by employers or anonymously, in others funeral parlors organised the burial. Some parlours even specialised in 'Chinese style' burials. Chinese burial practices in Australia varied as in China. Many Chinese would have been buried following as closely as possible the traditions of their ancestors, with a number exhumed for subsequent reburial in their home village in China. Some Chinese either by choice or circumstance had Christian burials. Others adopted and adapted burial traditions from both cultures. However many, like 'falling leaves' returned or tried to return to their roots in China before death. There were some specifically Chinese-only cemeteries, such as one in Darwin, however Chinese were mostly buried in 'Chinese' or 'alien' sections in general cemeteries. These sections were generally located in low lying areas of the cemetery beyond the edge of Christian burial areas. Many non-Chinese Christians refused to allow Chinese to be buried in the consecreted ground of the cemetery, even if they had converted and lived as Christians for much of their lives. Grave markers in the Chinese section of cemeteries tended to be simple wooden boards or rectangular stone markers often inscribed in Chinese characters with the name of the person and possibly the date of death and place or origin. Chinese cemeteries also commonly had shrines (large rectangular plaques with a wave shaped top) and burners (various designs), where friends and relatives burnt paper money in memory of the dead. There are many Chinese festivals associated with cemeteries and the dead. Those commonly practiced by Australia's Chinese were Ching Ming (Qing Ming) which begins at the end of the second month (around the Christan Easter) and Chong Yang or Double Ninth held around October on the ninth day of the ninth month of the Chinese calendar. Ching Ming is the traditional time to tend to graves and also involves making offerings of foodstuffs, burning paper money and other paper articles to help the spirit in the next world, lighting incense and setting off fire crackers to scare away the evil spirits. Chong Yang is a time for communicating with the dead. At this time it is possible to appease the wandering spirits of people who have not died a natural death or have not been accorded ancestral worship. Paper money and clothing are burnt in the cemetery burners and a grand feast is organised so that wandering spirits are properly fed and clad and are not tempted to claim a living substitute as a resting place. Sources used to compile this entry: Fading Links to China: Ballarat's Chinese Gravestones and Associated Records, 1854-1955, 1955, http://arrow.latrobe.edu.au/store/3/4/5/5/1/public/brumley/brumley.htm; Brumley, Linda; Lu Bingqun; Zhao Xueru, Fading Links To China: Ballarat's Chinese Gravestones And Associated Records, 1854-1955, History Department., University of Melbourne, Parkville, c1992; Golden Dragon Museum, Chinese Memorials and Memories: The White Hills Cemetery - Bendigo, Bendigo, Victoria, 2001; Jack, R. Ian, 'Chinese cemeteries outside China', in P. Macgregor (ed. ), Histories of the Chinese in Australasia and the South Pacific, Museum of Chinese Australian History, Melbourne, 1995, pp. 299-306; Ryan, Jan, Ancestors: Chinese in Colonial Australia, Fremantle Arts Centre Press, Fremantle, WA, 1995.